There are so many questions about lighting that I thought a small guide might be a good idea. It’s confusing how many options there are, and it never hurts to be prepared when shopping or looking for new methods of heating and lighting! This guide does not cover Under Tank Heaters (UTH). Those are a way to heat your tank that does not involve a heat lamp or light. Depending on your set-up a UTH might be a better choice for heat. When we talk about “lights” it can mean different things to different people. Most will probably think of a light that’s made for watching the crabs. Others will think of heat lights used for heating a tank. What a lot of people don’t realize is that you can get visible light without heating a tank, which can be a good thing if you already have the perfect temperature but it can also cause a panic when you thought that the light you bought was going to solve your cold temeprature problems. It all depends on the type of bulb and fixture you have. IF YOU DO NOT NEED HEAT, YOU DO NOT HAVE TO HAVE ANY OF THESE! Hermit crabs do not require light in order to thrive as long as the room is naturally lit during the day. They also need to have it dark at night, just like any wild animal. The lighting suggestions here are just options you can use to view and/or heat their tank. However, you may want to read about UVB to see if it is something that may be beneficial for your hermit crabs. Short answers, for those who want just the basics. There is lots more information below. Fixtures are what the bulb goes into; it’s the casing that hold the bulb and that plugs into the wall. 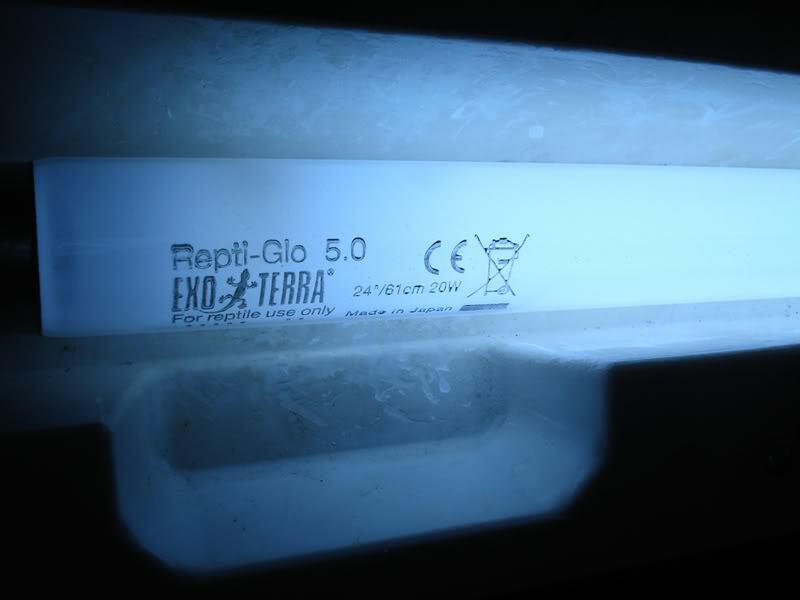 There are three main types of fixtures – florescent tubes, complete set, and screw-in. Florescent tube lights are the long skinny tubes that you see in any commercial building, while screw-in types are the ones you buy for use around your home that come with a single metal base. LEDs are newer and some of the fixtures that use them are sold as a complete set. Florescent fixtures can never be used for heating - they are designed to run cool and the bulbs do not produce more than a few degrees of heat that vents out the top. 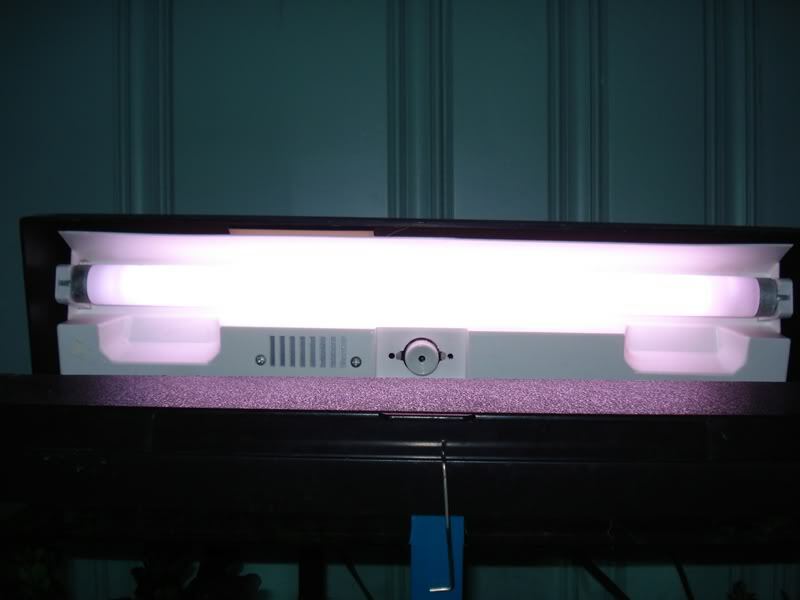 Florescent lights are only for daytime viewing and can also be used with specialty UVB bulbs. These types of lights are what come standard on larger aquarium hoods and are referred to as “strip lights”. LED fixtures are guaranteed to run for years and years before the original bulbs burn out. For pets they normally come as a “strip light” for use on aquariums, but they are also available in home improvement stores in different shapes, as replacement bulbs for screw-in fixtures, and even as rope lighting. These types of lights cannot be used for heating, and can only be used during the day. LED bulbs last so long that the bulbs may never need replaced. They also use a very small amount of electricity compared to other lighting methods. They produce next to no heat, and run even cooler than florescent tubes. LEDs can be purchased in any home store as normal househould screw-in lights, and there is a range of colors available. 'Daylight' would be closest to true white, and there is also 'soft white' which is a little more warm and yellow. There are also under cabinet and strip lights available at most home good stores that come ready to use. 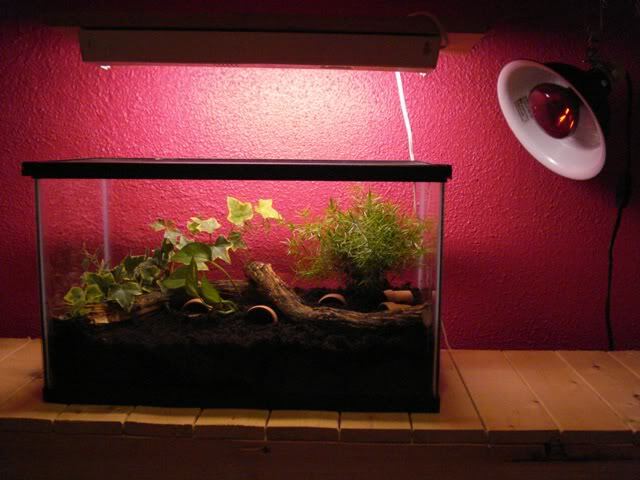 An upgrade to the ready to use fixtures would be aquarium light strips available from pet supply stores. These are more expensive and are meant to be used with fish, but the have the benefit of providing very clear and bright lighting that will cover the entire tank evenly. For those who are DIY inclined, raw strips of LEDs can be purchased fairly cheaply and made into any kind of shape one can imagine. White LED strips can be used during the day as a replacement for florescent or CFL lights. Blue and Red LED lights can be used for night time viewing as the brightness is very low and it should mimic dusk for the hermit crabs. (They really are quite beautiful and make it easy to see the crabs.) Blue LED lights are sold for marine set-ups to mimic dawn and dusk and stop light-shock in sensitive fish (and provide for evening viewing), and red LED lights are sold for reptiles as reptiles were once thought to not be able to see the red spectrum. However, the LED lights are not the same wavelength as the incandescent reptile blue and red bulbs we know are safe for use with hermits. Because of that, these bulbs should not be left on all night as we don’t know what effects it could have. If the light is too bright or too close to daylight (and it probably is), it could affect the hermit crabs natural day/night cycle and cause problems with molting. 100W household daylight LED bulb in a reptile clamp lamp. It glows!! Florescent fixtures come in three main sizes: T5, T8, and T12. This refers to the diameter of the tube and the spacing of the prongs on the end, NOT the overall length. Replacement bulbs do not have to be purchased from a pet store! You can find most lengths with the home light bulbs in places like Walmart, Home Depot and Lowes, however some lengths are considered a specialty size and are only sold for aquariums. A note about T12 – If you bought a new light it will not use this so you don’t have to worry, but if you bought a used tank or light strip, especially if it’s more than an decade old, then you’re likely to need this size. The US government ordered a phase out of these bulbs by July of 2012, though aquarium lights are most likely exempt from this ruling. However, that means that replacing them is probably going to be extremely expensive. There are conversion kits available that can turn a T12 into a T5, and if you have these lights and plan on using them long-term it might be worth looking into. Florescent bulbs are sold according to “color temperature”. This refers to the shade of light that they give out – red, yellow, white, and blue – and is measured in Kelvins (K) from 2,000 to 20,000. Natural daylight is about 6,500 K and is a great starting point if you want something that looks normal. Anything less than that will look yellowish, and down near the 2,000 mark it turns into red tones. For a more bluish look you would want to look into a bulb with a color temperature of 8,000K. Florescent bulbs for human use are usually between 2,500 and 6,500. For anything higher or lower you should look into aquarium bulbs, especially those made for salt-water tanks. The length of the bulb depends on the fixture itself. You should look at the old bulb for the measurement, and new bulbs are sold in inches. If you don’t have the bulb and can’t find the measurement on the fixture, measure where the bulb goes including where the prongs fit into. These are coiled florescent tubes that fit into screw-in bases. They run a little bit warmer than a normal florescent but they do not produce much more heat so cannot be used for heating. They are great for daytime viewing only and they cannot be used at night regardless of their color. (In other words, no using a black or red CFL party bulbs!) They can usually be found in any place that sells bulbs for your home. 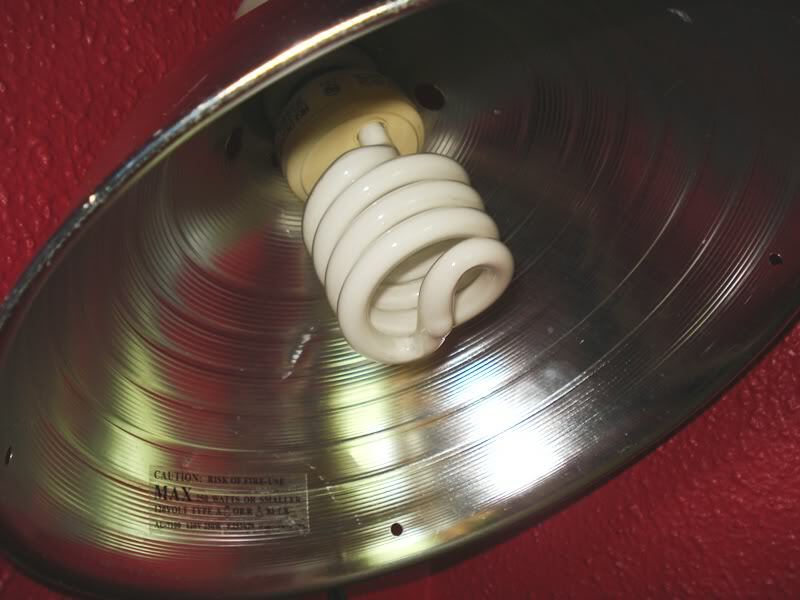 CFL bulb in 10 inch clamp lamp from hardware store. The great thing about CFLs is that they naturally run on a very low wattage and produce much more light than a comparable sized incandescent bulb. What this means is that if you have a fixture that only supports a 25W bulb, you aren’t limited to 25W of dull yellow light anymore - with a 25W CFL you’ll get the equivalent of 100W of bright white light! Watch the color of the bulbs when buying – for a nice, clean, bright looking tank you’ll want to look for “daylight” bulbs. “Soft white” bulbs put out a very yellow-looking light. UVB is something that must be used with reptiles as without it they aren’t able to synthesis vitamin D and they end up suffering from extremely horrific diseases affecting their bones. In theory, our hermit crabs should need UVB as well seeing as how they are active in daylight and come from the area around the equator. It’s something that some crabbers are starting to use, and those that have note an increase in activity and brighter colors on their crab. Please note - Sunlight coming through windows and into the tank will not provide the hermit crabs with any UVB. It gives them sunlight which they might appreciate, but the glass in the windows and the glass of the tank is going to filter out all of the UVB that is in the sunlight before it ever reaches the hermits. Also, tanks in full sun can have a greenhouse effect and overheat quickly, so make sure to keep an eye on the temps if your tank does receive direct sun! UVB is a really hard thing to use. Glass completely removes it if the light passes through it. The bulbs themselves are only able to produce UVB for around a year before the effect wears off and you’re left with a normal daytime bulb. The bulbs are also expensive in comparison to a normal bulb, and since they have to be replaced every 12 months the cost ads up. They are also only effective within so much of a range of the bulb, and if the animals stay too close they end up with a severe sunburn – something that could in theory affect our hermits as well. no glass, no screening. Not many people are able to set up their tank this way. You also have to read the directions on the actual bulb you are using since there are differences in strengths and brands, and you have make sure that the crabs are within the maximum effective distance but not so close they can be harmed. UVB specialty bulbs come in two types – florescent tubes and screw-in florescent (CFL). They use the same fixtures as mentioned above. They can only be used during the daytime, and they will give you visible light with which to view your crabs. They tend to look very blue or even green, so using a second yellowish light to cancel out that effect will give you more normal colors if you find it bothersome. Standard UVB bulbs of either type do not produce any more heat than a normal florescent or CFL and cannot be used for heating. They do sell a special CFL that contains a small ceramic bulb that can give you daylight, UVB, and heat all in one. 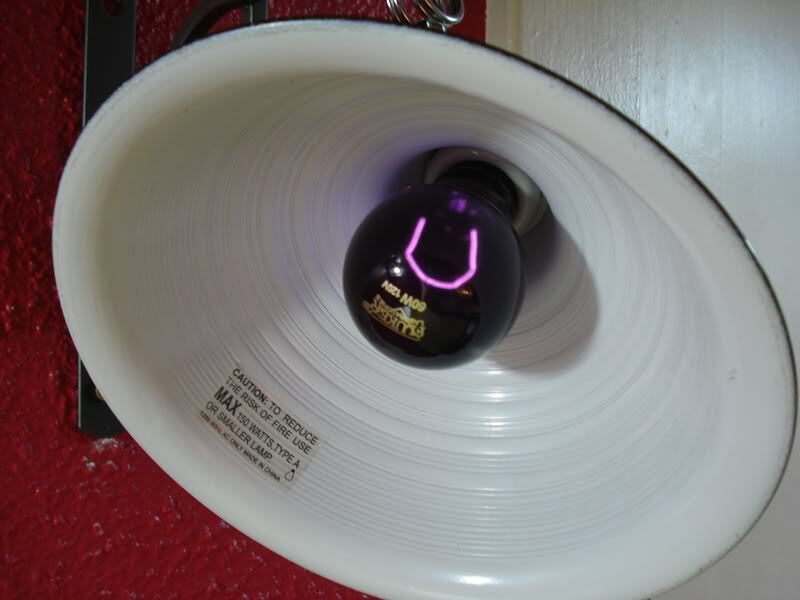 Three year old florescent UVB bulb. Note the odd blue-green light. 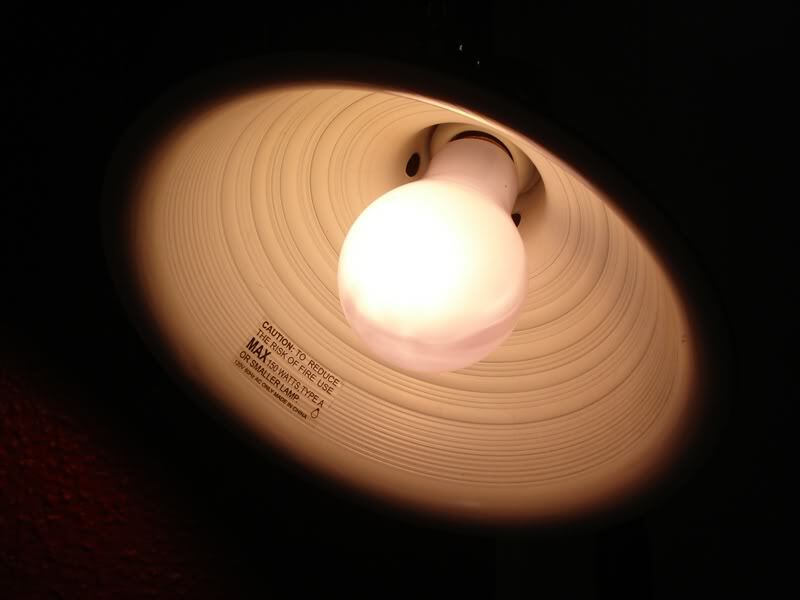 While it doesn't produce UVB anymore, the bulb can still be used for standard lighting! This is your classic “heat” bulb. They create light and heat by running electricity through a filament inside the glass. Up until about a decade ago this was the only option for having light anywhere in your home, but it wastes so much energy because of that heat that the US government has ordered all non-specialty incandescent bulbs to be phased out in order to save energy. You may still be able to find white incandescent heat bulbs for daytime heating of your tank in stores for a better price than at a pet store, but it’s going to get harder by the day. The wattage (W) listed on the bulb is how you can judge how much heat the bulb produces. There is no set way to say X amount of watts will raise your tank X amount of degrees, which makes it a guessing game as to what you’ll really need. Every set up is different, and everyone keeps their house a different temperature, and every house has different drafts and cold spots. Each brand of bulb also puts out a different amount of heat for the same wattage, and the color of the bulb also has an effect. White will be the hottest, followed by red, and blue runs the coolest by comparison. What this means is that if you know that a 40W white bulb makes the tank perfect, you may instead need a 50W or a 60W blue bulb at night to have the same temperature. Another thing to keep in mind is that the actual fixture you screw the bulb into will affect how warm the tank gets. I did an experiment when I first started crab keeping to see what would happen if I used the same bulb in different fixtures. I used it in a 5.5 inch clamp lamp, an 8.5 inch clamp lamp, and a 10 inch clamp lamp. The difference between the 5.5 and the 10 inch was that the 10 inch made the tank nearly 10 degrees hotter! And the 8.5 inch was right in the middle of that. Dimmers - One of the easiest ways to not mess around with bulb sizes is to buy a plug-in lamp dimmer at the hardware store for around $12 and buy the largest bulb your fixture can safely take. Look for a dimmer that is rated for 300W. All you have to do is plug the clamp lamp into the dimmer and the dimmer into the wall, and then use the slider to adjust how much heat the lamp is putting out. Bulbs should also have a longer life before burning out if they aren’t run on full power all the time. There are also reptile hoods made specifically for heating bulbs that can give you the option of having one fixture with two lights and two switches so you can run a white one during the day and then easily switch over to the night bulb. These hoods can be pricey though! White bulbs can only be used during the day. Blue or Red bulbs can be used 24 hours a day to provide heat at all times, or they can be used specifically at night. White or Daylight bulbs - these types of bulbs can only be used from sunup to sunset, and they will produce a lot of heat. They mimic normal daylight and provide an easy way for you to view your hermits. Remember that hermit crabs are from the tropics where there is nearly an even 12 hours of sunlight year round. The farther you get from the equator the longer the days get during the summer. In northern climates our sunlight times vary from 9 hours to 15 hours depending on the time of year. 100W GE Reveal (Natural Daylight) incandescent bulb for home use, in a 5.5 inch clamp lamp. 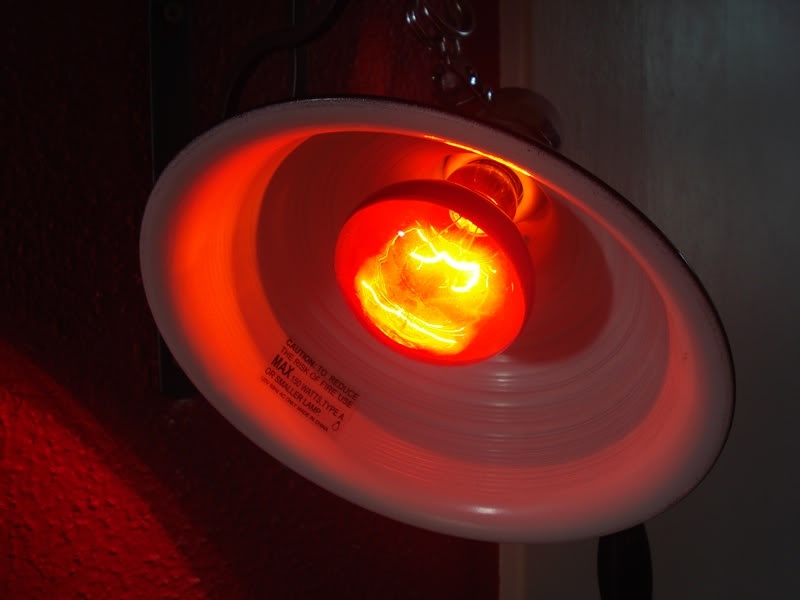 Red or Infrared bulbs – these are specialty reptile bulbs that are made to not disturb reptiles or insects since most of those species aren’t able to see the red spectrum. It was thought that hermit crabs wouldn’t be able to see the red light, but unfortunately this is not true. However, the red light doesn’t seem to bother them at all during the night, so it is still safe to use. Never use a red party light – always buy a special light specifically for reptiles. Red lights will make your tank a very bright red so be prepared for the glow! 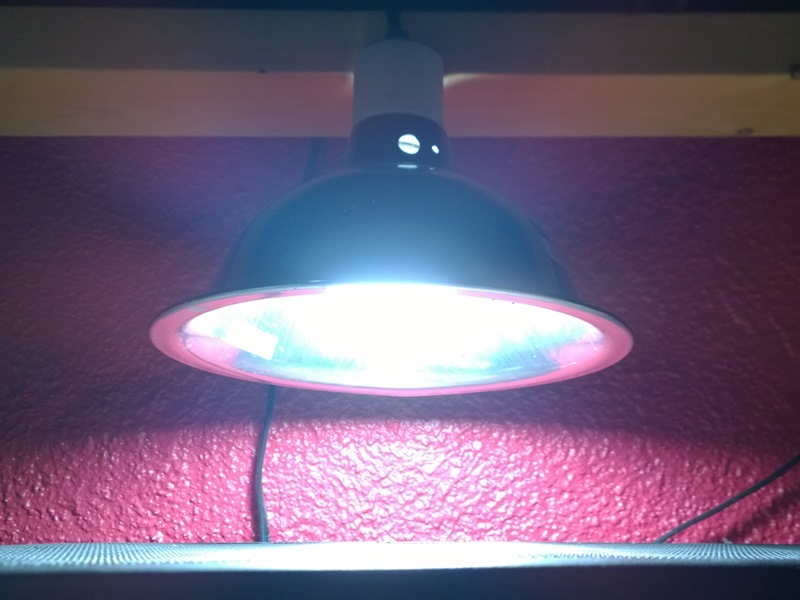 100W Fluker's Infrared bulb in matching 5.5 inch clamp lamp. Blue or Moonlight/Moon-glow bulbs – these are another specialty reptile bulb made to put out heat while they produce very little light. They glow in shades of purple and blue, and are so faint that they mimic full moon and star light. These bulbs do not affect the crabs at night. If you have the tank in your bedroom or another room where you need to use lights as heat and don’t want any disturbance from bright lights, then these lights are the thing to use. (Keep in mind that different brands will put out different levels of light.) Again, never ever use party lights or anything but a blue bulb made specifically for reptiles as the wrong type of bulb can cause eye damage to hermit crabs. 60W Fluker's Black Nightlight bulb in same fixture as above. “Spot” or “Basking” Lights - Any of the three colors above can come in bulbs marked “spot” or “basking”. What this means is that the bulb produces a very concentrated beam of heat that hits one spot in particular. Most reptile species are programed to seek sun when it’s time to get warm, and shade when they want to cool off. In a small tank this can be hard to provide, so the spot bulbs are used to heat one small area to the very high temperatures (120 degrees) that reptiles need while keeping the rest of the tank cool. These bulbs are not ideal for the hermit crab tank as we want a more even heating and no spots that are super hot or cold. A regular bulb that doesn’t have these words will give you much better even heat. Are exactly what they sound like! They are completely ceramic and are shaped to look like a normal bulb. A heating cable is run through the ceramic so that when it’s turned on the cable gets very hot, and the ceramic transmits that heat to whatever it is pointing at. They do this without producing any light. That said, there have been crab keepers who have used them in the past. One of the most effective set-ups I’ve seen using a ceramic bulb was from tnt4eva, who cut a hole in her screen lid and hung the bulb using just the ceramic base to a clamp lamp (without the metal dome) inside of the tank away from the glass and all decorations. 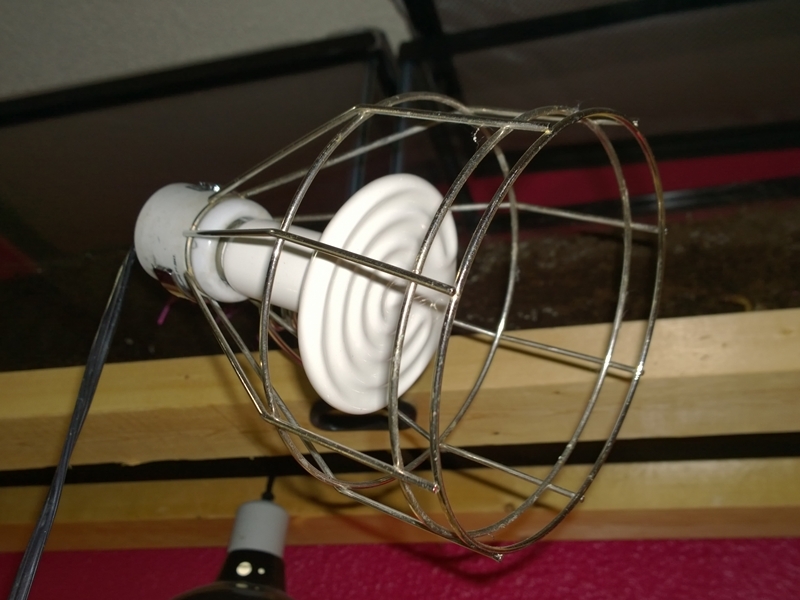 250W Ceramic heater in an appropriate wire cage fixture. A NOTE ABOUT HEAT LAMPS AND GLASS!!! Heat lamps produce a LOT of heat up close. I’ve measured my bulbs and they run between 300 and 500 degrees to the touch. Much of this heat dissipates quickly, and the fixtures themselves never get that hot (mine get to around 120 degrees). However, there has to be a cushion of air between the fixture and the glass of a lid or tank or there is a serious danger of cracking. Leave at least four inches between the bulb and the glass, and make sure there is air flow between the metal hood and glass as well - no matter if it's on a glass lid or aimed through the side of the tank. 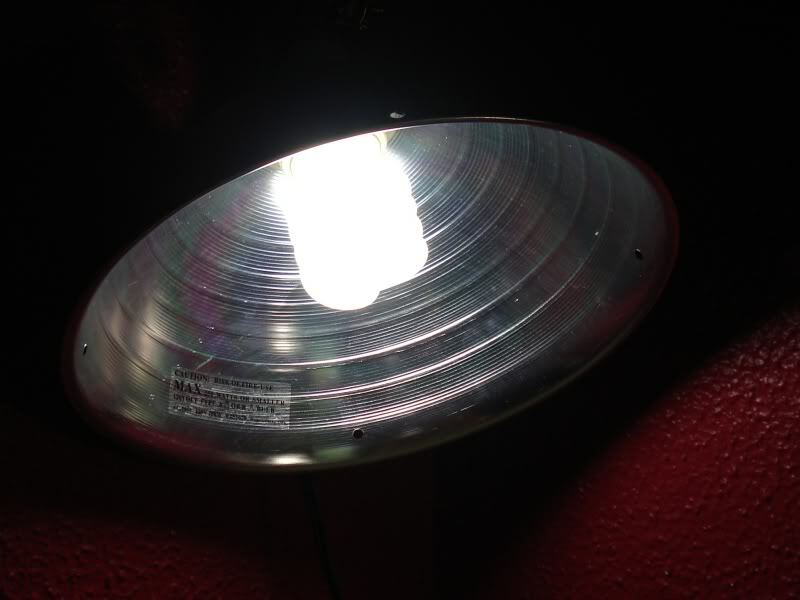 NEVER put your heat lamp directly onto a glass lid or the temperature will cause it to shatter. (Either the dramatic temperature difference is to blame, or there can also be small imperfections in the glass that expand with the heat.) Either way – it’s not worth the risk! 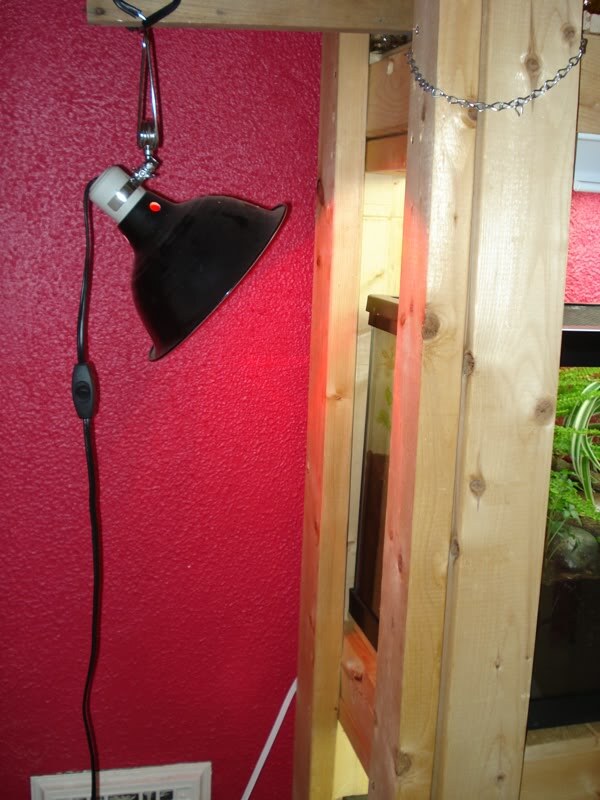 If you can’t find a way to mount the heat lamp so it is suspended, look into buying a clamp lamp stand from one of the reptile supply companies. 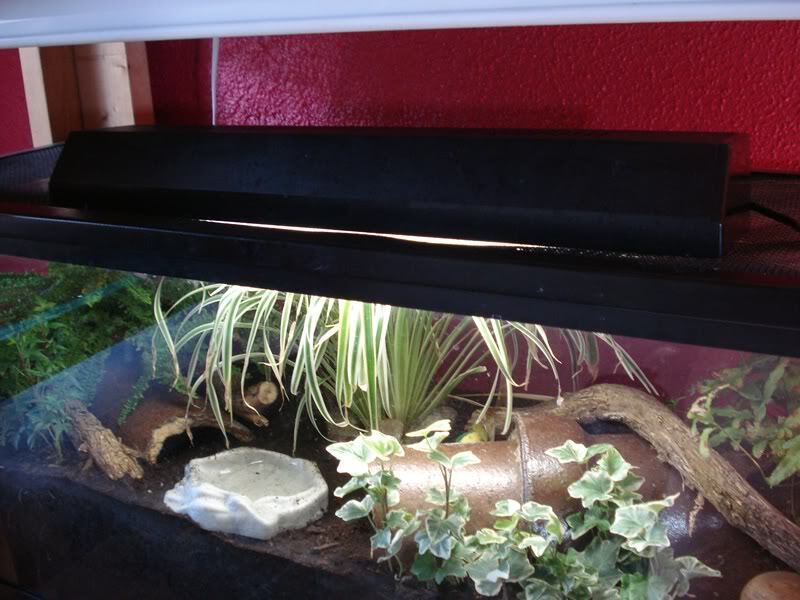 If you have a glass or plexiglass lid, or you're experiencing a humidity drop from having to make an opening in the plastic covering on a screen lid to prevent it from melting, then mounting a heat lamp so it aims into the side of the tank might be a better option. Your lid will stay intact and safe, and the tank will still get plenty warm if you use an appropriate sized bulb. The caution about using cool water in the tank is a must, as is leaving the light far enough away so that the glass doesn't get too hot. For aiming from the side I would never recommend putting the bulb closer than 8 inches from the glass. A 150W red bulb on a dimmer (turned off in photo) used to heat a 10 gallon tank. 100W red bulb used for heating a 30 gallon tank. The light is slid away and toward the tank as needed to control the temperature.